How can we embody the values of love, grace, and justice? As faith communities, how can our collective embodiment of these values shine even brighter? The answers to these questions must always unfold right here, right now, exactly where God has planted us. Neighborhood Church acts as a resource to inspire churches to become a vibrant and engaging community partner with the families and neighborhoods living around them. The need for transformation is acute. Congregational decline continues across all mainline denominations. The abandonment of the church by the millennial generation is ubiquitous; no denomination is escaping it. This is, in part, a consequence of disconnection from our communities. Van Tatenhove and Mueller believe that, parish by parish, we can reverse this trend. 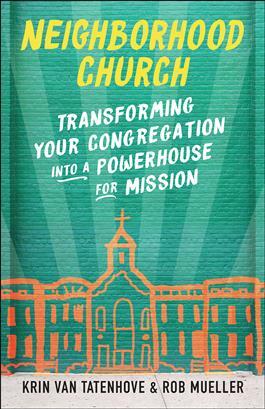 They dare to have an audacious hope for local congregations not only as signs of God’s kingdom but as life-giving institutions that anchor their neighborhoods. Drawing on their combined sixty years of parish experience, wisdom from Asset-Based Community Development, and compelling case stories, Van Tatenhove and Mueller do more than just call us to incarnational ministry. They give practical, essential tools that lead to communal conversion, develop the DNA of listening, spur fruitful partnerships, promote integrated space, and sustain long-term visions. They believe these tools will spark true revival and unleash the power of incarnational ministry. Download the free church study guide. Descargar "Resumen en español" (Download Spanish-language chapter summaries).